From Roscoff Brittany the route follows the Nantes to Brest Canal which crosses Brittany from West to East, its land and its people. Roscoff is a port that you can reach by ferries coming from UK and more particularly from Plymouth (England) and Cork (Ireland). This cycling holiday is an invitation to discover Brittany by bike along quiet tracks away from traffic. 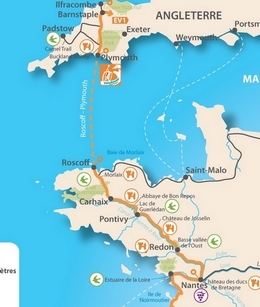 The Velodyssey is the longest cycling route in Europe fully signposted from Roscoff to Hendaye at the Spanish border, hundreds of km, to link England to Spain along the Atlantic coast. This first section in Brittany follows the Canal called the Oust built to link Nantes to Brest : a wonderful cycling route dotted with lovely charming towns like Malestroit, Roscoff, Josselin and amazing castles particularly the fortified Castle of Josselin and its impressive towers falling in the canal. Along the way discover the Abbey de Bon Repos, restored in 1986 and holds beautiful exhibition today, the Guerlédan lake, Pontivy and Josselin with beautiful castles, facades and town homes. 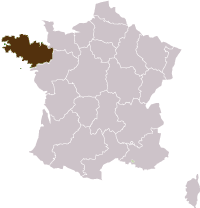 Josselin is listed as « small town of character ». This bike tour takes you through Brittany’s calm countryside. A charming trip for all lovers of cycling travels. Arrival in Roscoff. You meet with our guide at your hotel around 6 PM for an orientation meeting. From the Roscoff port you ride along the Morlaix Bay. You’ll enjoy passing through Saint-Pol-de-Léon with its beautiful church and charming historical center. Arriving at the Morlaix port you can feel, like the sailors arriving by boat, the depth and magnitude of the valley. From Morlaix you head on small roads which take you into in the Brittany countryside. You cycle on a pleasant greenway to Carhaix and avoid the hilly Mont d’Arrée. Your bike takes you 200m above sea level, reaching the canal’s highest point. This is where the Glomel trench was dug, where many convicts lost their life digging it. For you it’s a delivery, as a descending false flat of dozens of kilometers awaits! The Guerlédan lake and its hydroelectric dam offers a great vista as you ride above it. You can even have a swim in the lake if you stop at Murs-de-Bretagne beach. From one castle to another, you connect two historical cities. As you approach Rohan, you will discover the Abbey of Notre-Dame de Timadeuc. A community of monks lives there under the rule of Saint-Benoit. They produce cheeses, jams, fruit jellies which you can find in their shop. The beginning of the route takes you to the Roc Saint André which offers an impressive religious architecture. The village is also known for its famous Lancelot Brewery. You can make a halt and enjoy the traditional beers and Cola from the Phare Ouest! A few kilometers further and you're in Malestroit, a small typical town where you can enjoy a meal. Later on, as you face the cliffs of the Ile aux Pies, which lie on the other side of the canal, Brittany shows you just how surprising it can be. Change of scenery after Redon. The landscape is more open and allows for more sun to shine to come your way. You pass by a few cafés where it’s good to take a rest and sip a drink on the terrace. From your hotel you ride along the Canal until Quiheix, its last sluice. Small roads take you to Nantes. You spend the night close to the Loire River. Night in a 3*** hotel. Distances: 40 to 70 km per day, around 450 km for the entire trip. Height difference: from 200 to 600 meters per day. A combination of small family hotels (2 and 3 ***) and B&B, with a warm and friendly atmosphere. These establishments are used to welcoming cyclists and hikers. This Cycling tour can be upgraded in only 3*** star accommodation on request. Access : FERRIES FROM UK - train station.